When the phrase 'heritage conservation' is mentioned, most think of Kathmandu Valley's temples and ancient monuments. But also critically endangered are Nepal's intangible heritage like its festival - and traditional occupations. As the younger generation moves away from the jobs of their forefathers, many precious skills are on the verge of vanishing forever. For 72-year-old Lalit Prajapati, life literally revolves around his potter’s wheel. 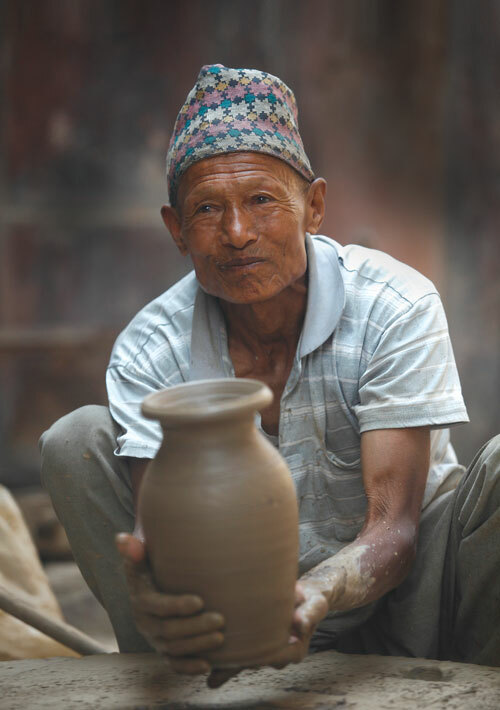 Ever since he was 12, Prajapati has occupied a small space at the entrance of an alleyway that leads to Bhaktapur’s famous Potter’s Square, where he creates a variety of earthenware vases used in rituals or as piggybanks by children. This is a skill passed down from many generations. “My grandfather taught my father, and when I turned 12 my father taught me, and when my sons were old enough I taught them,” says Prajapati who started with small oil lamps and moved to more intricate clay vessels. One recent morning, Prajapati was deftly moulding a revolving lump of clay into a vase. He did it in three minutes, while simultaneously talking to a visiting reporter. In his childhood, Prajapati remembers good clay was plentiful and there was a lot of demand for earthenware. Today, clay is hard to come by and people are switching to plastic or metal utensils. There used to be a time when at least 100 families in Bhaktapur were potters. Today, there are only 30 households. Prajapati is the only potter who still uses the traditional wooden hand-operated wheel which he bought 50 years ago. For the first time in 70 years, Krishna Awale is not planting corn this year. He is not readying his land for paddy seedlings, either. The 84-year-old stoops, and breathes heavily, but that is not the reason he is not tilling the land anymore — there is no more land to till. The farms he used to cultivate on the outskirts of Patan have now been turned into parking lots and malls. His own ancestral land was parcelled out long ago and sold off. 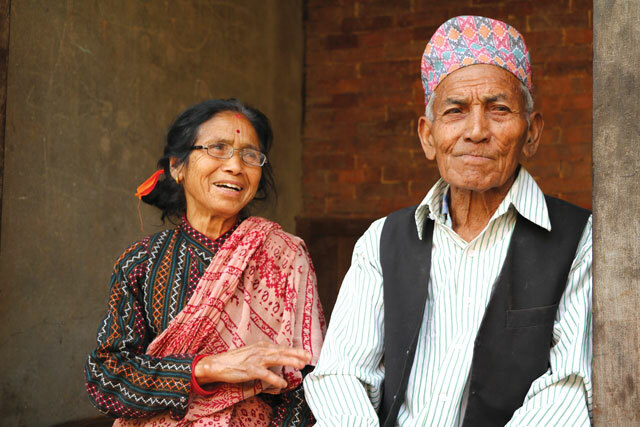 This week when we met him in Chyasal, Awale was sitting near his home with his wife, Bhinmaya, 79, remembering old times (above). His gnarled fingers are a striking testimony to his ties with the land. They are still for the first time in his life as a farmer. This is the last generation of the Awale family that will plant paddy, their extraordinary knowledge of nature, the seasons and soil, seeds and weather, will vanish. “I keep telling my son to work in the fields, but he doesn’t listen,” says Bhinmaya, pointing at her son Gopal, a bronzesmith, who is taking his son to college in a scooter. With no land of his own to farm, these days Krishna helps out other farmers in the area. They come to ask Krishna’s advice on when to plant, what seeds to use and what to do about a pesky pest destroying the potato crop. Bhinmaya worries that even if she and her husband put everything they know down on paper with charts and tables, it still won’t do any good. “There is no more land to farm,” she says simply. 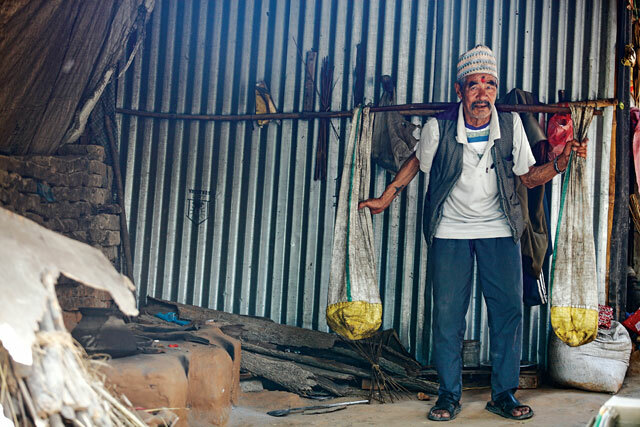 Bhimlal Dangol, 77, remembers a different Kathmandu Valley from his childhood — one with narrow lanes and green farms, blue sky and clear air. He travelled across the Valley with his father, sometimes even to the Tarai to sell the mustard oil that his hometown of Khokana is famous for. Dangol’s father worked for Juddha Shumsher Rana, and learnt to bake and press oil from mustard seeds at a young age. He used to hike down to Hetauda to buy mustard seeds, hauled it back to Khokana, made oil, sold it to clients in the Valley, walked back to Hetauda and traded the remaining oil for more seeds. “Everything was manual in those days, even the oil mills,” recalls Dangol.“Since most of the households here were involved in the same profession, the oil pressers were jointly owned.” Today, with competition from imported soya and sunflower oil, and farmers not growing mustard anymore, most of the pressing machines have shut down in Khokana. Kanchi Napit, 40, unfolds a piece of cloth and takes out a shining steel blade — the chhalancha — that she uses to cut nails. Then she takes out a small brass bowl for water, and the red alah powder and small brush. These are the tools of the trade for Nepal’s endangered traditional nail-cutters. Every day, Napit (above) travels to as far as Chobhar from her home in Bungamati to perform the lusithikegu — a purification ritual in which women cut their toenails, and colour their feet. She works for her jajman, the clans with whom her family has worked for generations to trim nails during birth, marriage, death and other life-cycle ceremonies. Napit’s family have been professional nail cutters and barbers for as long she can remember. She learned the skills from her in-laws when she was 15, and her husband Bachhu has been a nail cutter and barber for the families of the priests of Rato Machendranath. Traditionally, the payment for Napits is not cash, but rice from the jajman twice a year. But as farmlands dwindle, the families pay them Rs 1,200 a year. “These days, the amount of grain and the money we get from the traditional job is not enough to feed the family and send the children to school,” says Bacchu, who has opened his own barber shop near the bus park in Bungamati to augment income. In the mornings he works for his jajman and runs the barber shop for the rest of the day. “I am the first generation in my family to have a shop, it is not sustainable to work just from home anymore,” he says. But it looks like Bacchu and Kanchi will be the last in their generation to be barbers and nail-cutters. Education is one reason, and inter-caste marriages are another. There is also a stigma attached to what is regarded as a lowly profession. "This Dasain, don’t drink if you drive." The valley traffic police has stepped up breathalyzer tests on Kathmandus main arteries, motorcyclists and bigwigs on Pajeros are all tested. There is no right to strike against the public by anybody, anywhere, any time. This is a tale of broken promises, corruption and botched attempts at providing Valley residents safe, reliable and clean public transport.